With the holidays now behind us (though I’m still hanging out at mom’s house, it’s heaven), it’s time to get to this week’s Daredevil #11. It’s a strong issue overall with a couple of interesting twists. The artwork is great, as always, and there’s heavy focus on the “Matt side” of the Matt-Daredevil equation, which is certainly something I appreciate from time to time, and I suspect I’m not alone in this. Especially since Daredevil #12 looks to be much heavier on the Daredevil action. I will readily admit to being concerned when I saw the preview for this issue, which covered the first three pages. Foggy is apparently ghost writing Matt’s autobiography, and Matt is not taking any of it seriously. What was really going on here? Agreeing to write the book seemed out of character for Matt in the first place, and now he wasn’t even going to take it seriously? Well, first thing on page four is big twist number one: Matt desperately needs the money to pay for Foggy’s treatment. It’s just a throwaway flashback panel, but tells us all we need to know to do the math ourselves. And, it also explains why Matt’s heart may not be fully invested in the project. There is still more to explore here, which I’m sure we’ll have reason to get back to in coming issues, but for now it presents us with the proper context for this particular subplot. We move on to the main plot of the issue when Kirsten drags Matt with her to meet their new client George Smith, who is none other than the Stunt-Master we know and love(?) from the Silver Age (Matt was about to retire as Daredevil after revealing his secret to Karen, when the Stunt-Master conveniently put an end to those plans in Daredevil #58, by Roy Thomas and Gene Colan). Smith is looking to sue the “new” Stunt-Master, a death-defying stunt rider who has assumed the former’s name and appearance. As it turns out, he also doesn’t mind a borrowing from our main character, which bothers Matt a little more than he’s willing to admit. Matt and Kirsten decide to take the case, weak as it may be, and do their best to help. 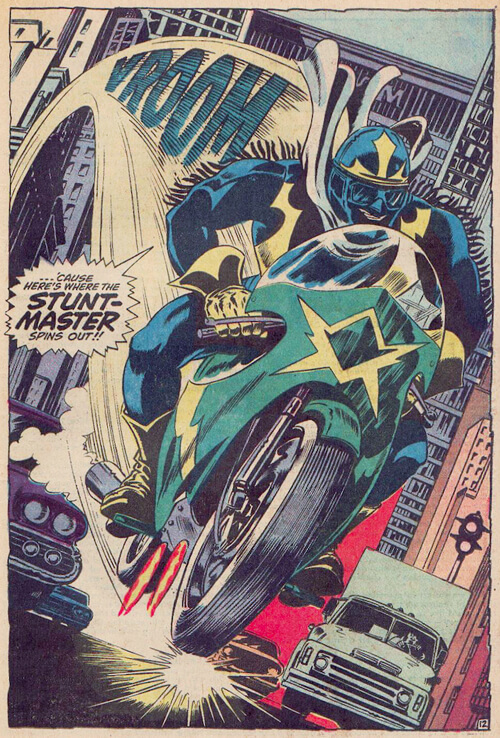 Throughout the issue, we learn more about the new Stunt-Master’s MO, but it isn’t until the very end that things turn really sinister. I was pleasantly surprised to see the creative team take what might at first seem like a motorcycle ride down memory lane, and do something this chilling with it. I don’t 100% get the actual mechanics of how the villain(s) pull off their trick, one of few weaknesses in this issue, but I suspect that will be addressed next time around. Either way, I’m definitely intrigued, which is a very good place to be at the end of a first chapter. This issue is solid in every way. The pacing, always one of Mark Waid’s best events, is spot-on, Samnee continues to excel at giving us a story that would make sense visually even without a single line of dialogue (which is never a small feat), and Matt Wilson’s colors are beautiful. 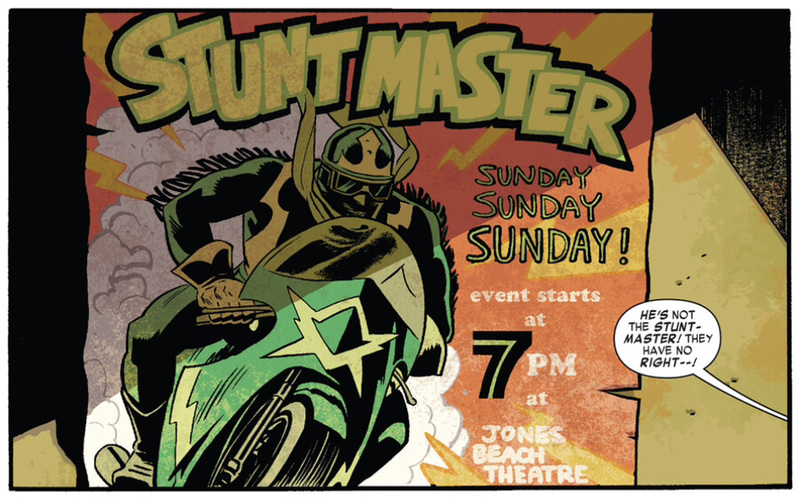 It almost seems like the entire issue somehow matches the contrasting green and orange of the Stunt-Master “brand.” Of course, I may just be imagining this. On the other hand, that in itself is telling. 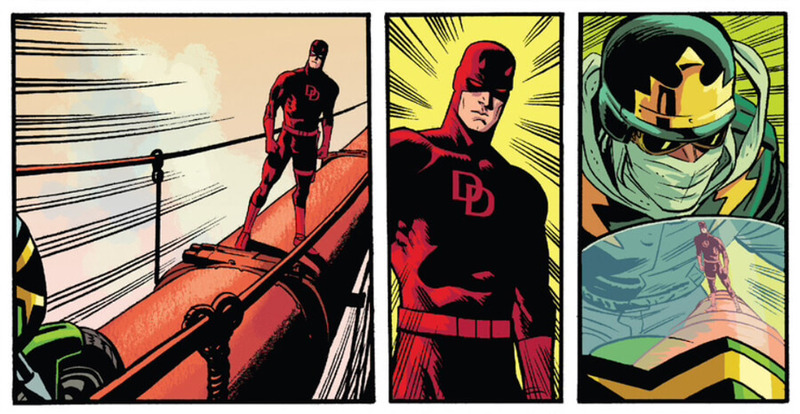 One thing I love about this creative team is how they make every panel count, and make even the quieter ones about more than “just” telling the main story. Case in point, this adorable panel of Matt signing his autograph for a blind boy out for a walk. It makes me wonder whether that was in the script or if this is how Chris Samnee keeps himself entertained. Either way, it’s very much appreciated and is the kind of thing that makes each and every issue worth a second, third and fourth look. I’m enjoying this new Stunt-Master more than I had expected, and the plot suggests that those who dismiss this book as too bright might have to reconsider. Personally, I’m looking forward to the end of this story, as well as the development on the other subplots touched on in this issue. Keep up the good work for however long we get to keep you in 2015! Oh wow I saw him signing the autograph but I was too focused on enjoying the fact that he was signing with his left hand to notice that he was signing it for a blind boy. But seriously, in universe, that has to be great. All those kids who only a few years ago, Matt took on a field trip in the snow (and then rescued), realizing that was really Daredevil. I also really like you wondering if that’s Samnee just keeping himself amused. Perhaps you should ask him? And excellent review as always of course. @Aidan, yes he is. It was mentioned a few months back when he fought the Shroud. Except for the “book thing” this was a great issue. 8/10. Samnee as always brings it. The page with the 3 panels and three simple words: “Now I care.” Perfection. I like that Matt was keeping his cool and trying to work with Kirsten through the law to get things done at first. I agree the logistics of the new Stuntmasters scheme are a little iffy, but that was done so well that I don’t care. 1) People who’ve had to work their way up from poverty (as Matt has done twice in his life) typically aren’t as frivolous with their money. 2) Matt has been shown to be quite the philanthropist when he has been in periods of success, again not the type of person to be careless with money. 3) Yeah there are times when Matt has let his various practices suffer. Usually this is from taking pro bono work in order to help clients down on their luck or his DD life caused him to neglect, not because he went and bought a bunch of expensive suits. 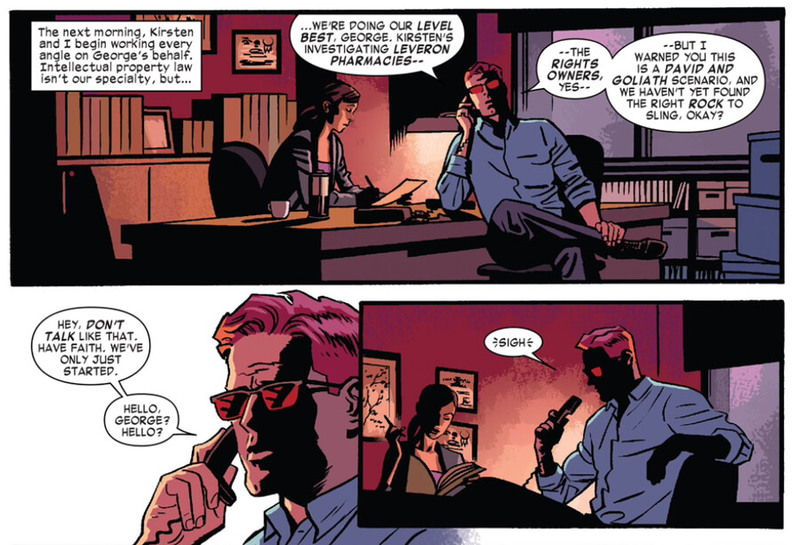 And all that aside, Foggy Nelson would never go along with the book deal even, and especially, if he knew the reason Matt was whoring himself out and insulting everyone he’s ever known. But this was a small part of the overall issue so I give the issue very high marks. Hopefully Mr. Waid and Mr Samnee can keep up this quality through the rest of their run. Am I only one who hates Kristen McDuffie? I wish Waid had used Dakota North, she’s way better and fleshed-out character IMO.